Amy Gilson, PhD, is a member of the 2018 Class of CCST Science & Technology Policy Fellows. 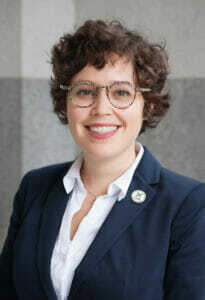 She received her PhD in Chemical Physics from Harvard University and completed a PhD minor in Science, Technology, and Society Studies from the Harvard Kennedy School of Government. She received a BS in Chemistry from UC Berkeley. 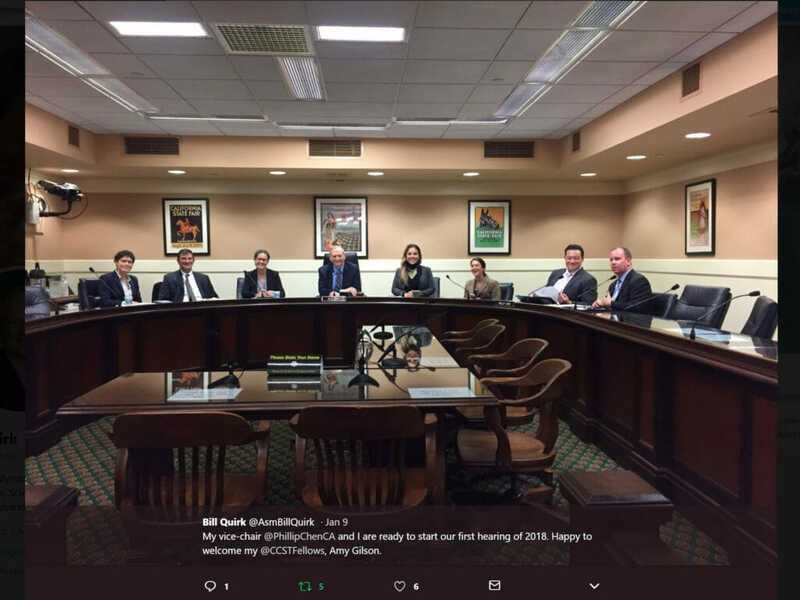 Gilson’s fellowship placement is with the California State Assembly Committee on Environmental Safety and Toxic Materials and Assemblymember Bill Quirk, PhD (D-Hayward), Committee Chair. For six years I lived a twenty-minute walk away from my graduate school lab. Now, I am just a twenty-minute stroll from the hip Midtown neighborhood in Sacramento to the State Capitol downtown. A mile, however, is a lot longer in dress shoes. Rookie mistake — by the time I arrived at CCST offices on the first day of orientation, my left shoe had already scraped up the skin on the back of my foot, and the professionalism of my business formal outfit was undercut by the blood spreading up the hem of my pants. But I didn’t let a blister stop me from getting started on the right foot. 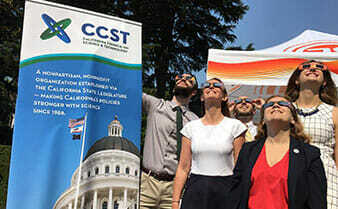 The CCST Science & Technology Policy Fellowship begins with a month-long “policy boot camp” training at CCST headquarters. The training covers a lot of ground (California is a big state!) 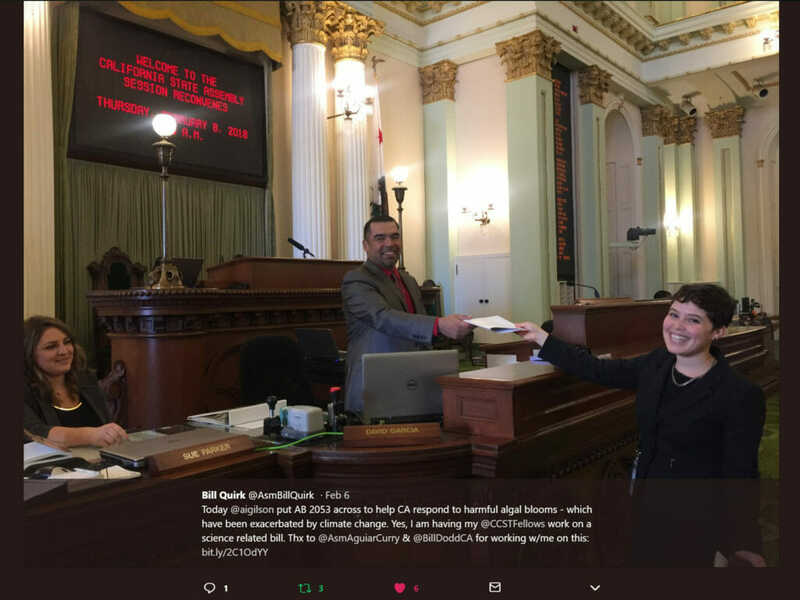 from California history to its political process, plus the specific professional skills fellows need to flourish as legislative staffers. 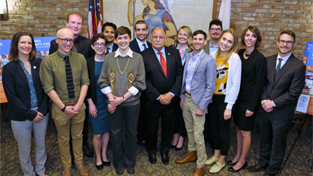 It also gives us, the 10 members of the 2018 Class of CCST Science Fellows, a chance to bond and connect with the fellowship alumni who preceded us. 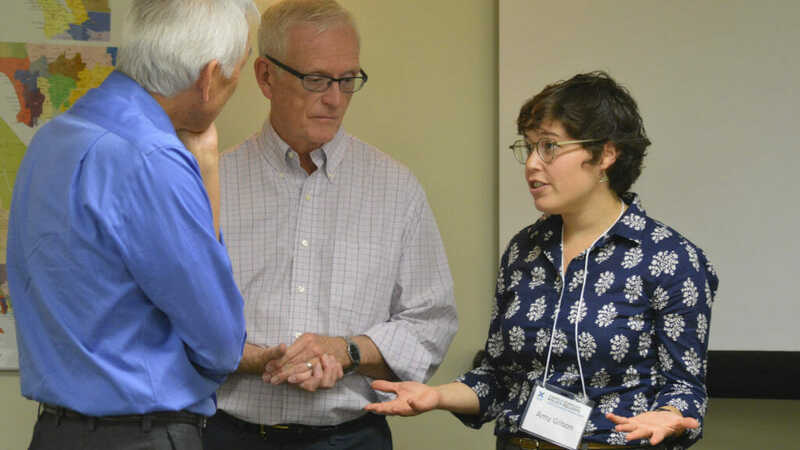 2018 CCST Science Fellow Amy Gilson puts on her acting hat during a mock networking session with CCST advisors Randy Chinn (left) and Doug Brown. 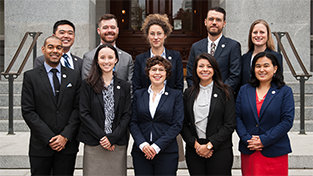 On first day of training, we began with CCST Deputy Director and fellowship program director Amber Mace, fellowship program manager Annie Morgan, and fellowship advisors Doug Brown and Randy Chinn, who gave us a rundown of what to expect from our year in Sacramento. We also met retired and current legislative staffers, former CCST Science Fellows, and other Capitol professionals — all of whom volunteered their time to speak with us and share their insights on working the Capitol. This was followed by a several-day California history-and-politics intensive, led by Professor Thad Kousser, Chair of the UC San Diego Department of Political Science. 1. Keep confidential information confidential. Staffers handle politically sensitive information and must earn and maintain their colleagues’ trust. 2. No one likes surprises. Folks can take bad news, they just want to know it’s coming. 3. Be nice to everyone. Someone opposing you on a bill this year could be your next bill’s biggest supporter. A new staffer today could be an elected legislator in several years’ time. A staffer’s success in the Capitol landscape depends on their ability to value and build relationships with people. These principles have become common refrains when I receive advice, and luckily, they are self-evident and easy to remember. However, putting them into practice inside the Capitol takes significant experience — parsing what is confidential and when people need a heads-up. Of course, that’s where the fellowship comes in, giving us the practice and guidance to hone these invaluable instincts. 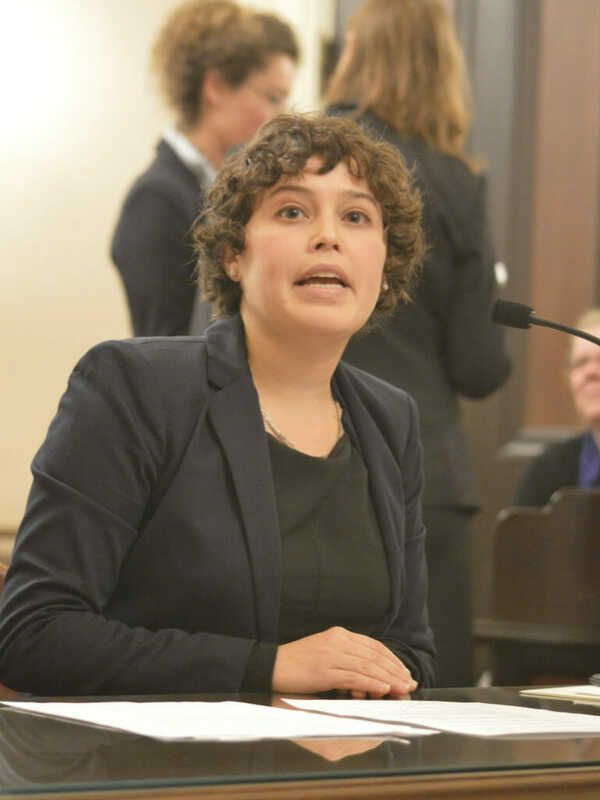 2018 CCST Science Fellow Amy Gilson presents a bill during the annual mock hearing exercise held as part of the “policy boot camp” for incoming fellows. The message of the #MeToo movement also ran through our training. We began the fellowship a mere two weeks after nearly 150 women lobbyists, lawmakers, and staffers published an open letter declaring that they too had experience sexual harassment and assault in their line of work. The actions this letter catalyzed are ongoing — both legislative houses have since held hearings on sexual harassment and are reformulating relevant policies. Unfortunately, the issue of sexual harassment was not new for those of us coming from academia. What was new for me, however, was that Amber and high-ranking staffers took time to sit down with us during the opening days of boot camp to talk about their own thoughts and experiences with harassment. Rather than shying from the topic, we discussed it directly. It felt good to know that CCST would be there for us throughout the year — to answer questions, troubleshoot, and to back us up if ever need it. So yeah, while I may have literally limped into the opening of my training — I definitely feel like I left with a leg up on my fellowship year!